There is no tsunami warning issued from this event. Yet another strong quake in Italy. Yikes. Hi Cambium, the area near Marche and Umbria border already had two earthquakes in the evening of October 26th (5.4 and 5.9). The second one was felt strong here too (150 km northwards) and we had to ran out of our home. Villages in the Apennines near the epicenter were evacuated. This morning earthquake was scary and stronger than the previous ones (6.5), home walls were shaking and it was a very bad feeling despite living far from the epicenter. Ugh, sorry you have to be dealing with this. I think I read somewhere scientists were predicting a big one. 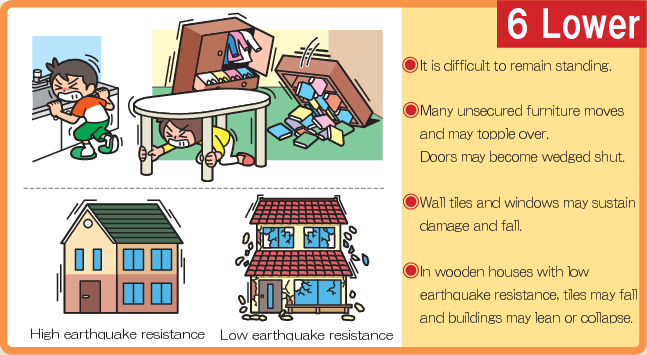 What I dont get is why are the aftershocks stronger? Or is this the beginning of something bigger? Hope not ! The situation is not completely clear, because the geological situation in there is really complicated, with several little seismic faults near one to the other and whose activities are strongly related. Since yesterday geologists said that the earthquakes of last Wednesday were related to a different fault than the one that caused the earthquake of August. Today instead they say that the new earthquake that happened this morning is related to a segment of the same fault that caused the August earthquake, just a little bit farther north. In practice after each shakes the seismic fault move a little bit, and this movement can cause new tensions in another segment of the same fault or in another fault parallel to the first one. If the tension is too much, a new earthquake can happen, and nothing exclude that the new earthquake can be stronger than the first one (it all depends on the amount of accumulated energy, and we don't know how much energy is accumulated in that system of seismic faults, nor where it would eventually be released). The situation is extremely complicated, and they can't predict an earthquake as they do with the weather forecast. Anyway, another strong earthquake on the same area is not impossible at all (the same area had events even stronger than this in the past centuries), and so the alert is really high. We can't exclude nothing right now. Circles are earthquakes with a magnitude comprehended between 2.0 and 4.9 (the largest is the circle, the highest is the magnitude), the stars are the shakes with a magnitude >=5.0. The red star is the shake that happened this morning, the yellow and orange circles are the shakes in the last 24 and 72 hours respectively, while the blue ones are the oldest (since the 24th of August). What worries me about the earthquakes in Italy is this. 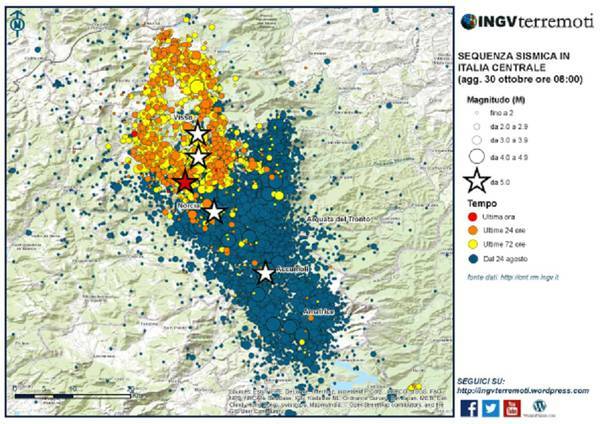 I have the impression that the two phenomenons are not related, this is more related to volcanoes activity than to the seismic activity in the Apennines, in that cases little earthquakes are more the symptom of volcanic activity. Anyway, the Vesuvio and the campi Flegrei are constantly monitored and, luckily, volcanoes are (usually) much more predictable than earthquakes. 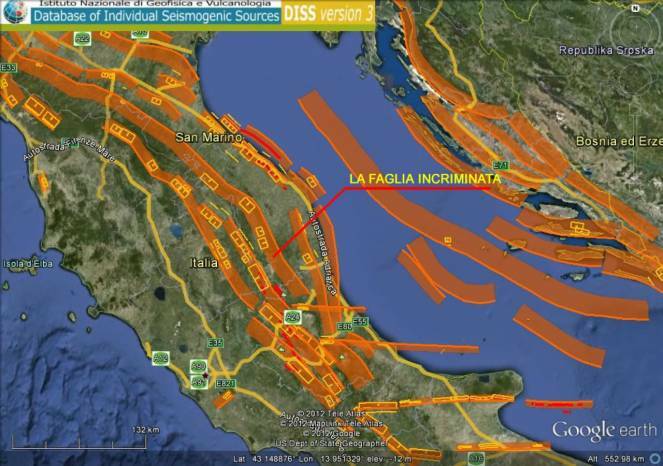 The INGV (national institute of geophysics and volcanology) makes a weekly report of the Campi Flegrei's situation (recording earthquakes associated to volcanism, changes in terrain elevation, composition and quantity of emitted gasses), and right now the situation seems quite stable. Also, it is not certain if the next volcanic phenomenon will cause an Apocalipse on a continental level. That area had several eruption, the last one in the XVI century, but only two of them were destructive on continental/global levels (15 000 and 39 000 years ago respectively). Just had a severe earthquake here about 20 mins ago. A 6.8, and at a depth of 16km. Centred about 200km SE of here Shaking lasted about 90 seconds and strong enough to need to hold on to something. Three aftershocks since then. Wow! I just saw a 7.3 preliminary measure.